Seamless Asia 2018, staged from 3 to 4 May 2018 at the Suntec Convention Centre in Singapore, marked another key milestone going forward to positioning itself as the most important conference & exhibition for payments, e-commerce and retail in Asia. The event concluded with an upbeat interest from trade visitors and industry professionals, gathering in excess of 200 thought-provoking speakers and trailblazers from across the region to share their insight in a wide spectrum of global issues and specialist topics. 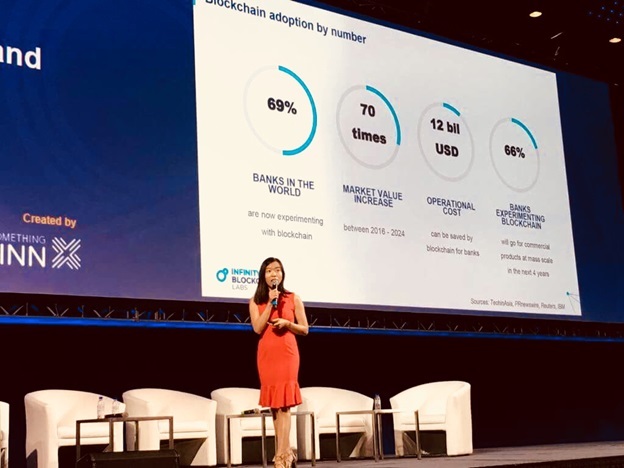 Ms. Nicole Nguyen, Head APAC of Infinity Blockchain Ventures (IBV) attended Seamless Asia 2018 to speak on a number of key issues surrounding the emerging blockchain landscape, as well as its enormous impacts on the payments industry. Complementing the keynote lineup at the conference included, but not limited to: Amazon Pay, Bank of Thailand, State Band of Vietnam, MasterCard, AirBnB, Rakuten. Seamless Asia, first launched in 2017 by the Terrapinn, is Asia’s largest and longest running conference focused on cards and payments, as well as a dynamic summit and large scale exhibition bringing together the converging world of ecommerce, retail and payments. With roughly 6,000 participants, 200 speakers, 200 sponsors and exhibitors in attendance, Seamless Asia offers an unparalleled platform for leading minds, entrepreneurs and innovators to seek new business opportunities, new ideas and new partnerships. Seamless Asia is comprised of three main themes: Payments, E-commerce and Retail. Seamless Payments brings together the entire payments ecosystem to discuss, debate and evaluate alternative payment strategies and technologies. Seamless Ecommerce gathers a strong lineup of entrepreneurs and innovators across the entire ecommerce value chain, from storefront creation to digital marketing, from payment to fulfilment and delivery. Meanwhile, Seamless Retail provides Asian retailers with new ideas, exciting innovations and cutting edge technology in order to adapt, grow and thrive in the new world of connected commerce. 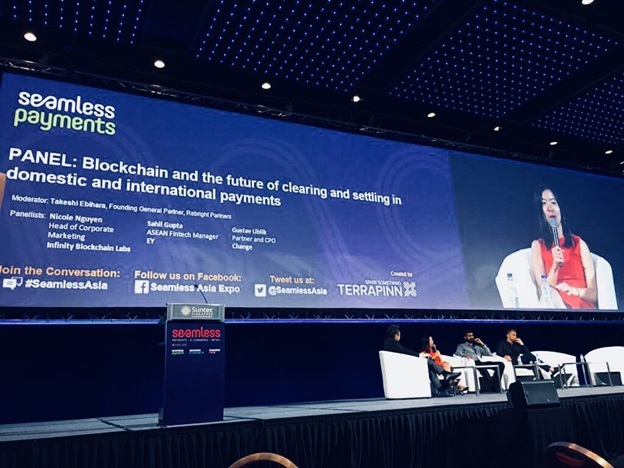 At Seamless Asia 2018, IBV representative, Nicole Nguyen, Head APAC of Infinity Blockchain Ventures, had the opportunity to partake in a distinguished panel discussion under the theme of “Seamless Payments: Innovation”, together with a power-packed lineup of visionary speakers and industry experts from Rebright Partners, Ernst & Young LLP; and more. At the panel, Nicole provided a depth of knowledge and her profound understanding in the field of blockchain, particularly the popular use cases of blockchain technology in payments processing. Additionally, through unique networking opportunities with senior professionals from across the payments, e-commerce and retail sectors, IBV can further expand its regional role while simultaneously raising the profile of Vietnam’s blockchain landscape. How does blockchain (public or private) solve many of the problems we’re seeing? What needs to happen for blockchain to be more impactful in this area? On the other hand, Nicole also had the opportunity to share some of her learnings and key experiences in the field of E-Money and virtual currencies, through another seminar session entitled “E-Money: The Gateway to Enhanced Security and Adoption for Blockchain Payment”. The presentation highlighted some of the ever-relevant issues of the blockchain adoption in finance and payment services, the development roadmap of blockchain from 1.0 to 4.0 in response to tightening compliance requirements, along with the E-money as the gateway for efficient, compliant and secure payment services on blockchain. Blockchain, the technology underlying cryptocurrency bitcoin has received a big thumbs up in the business world, quickly becoming the new buzzword for innovation in the payments industry. A multitude of industry players are in the midst of exploring the potential uses of blockchain given its conspicuous advantages with regard to speed, accuracy, cost effectiveness, security, and much more. One of the fundamental purviews of any payments company is to provide highly secure payments service, and blockchain certainly has enough powerful and valuable characteristics to fill the needs here. Data for transactions occurring through blockchain can be stored in a permanent, verifiable and incorruptible way. Data theft becomes highly impossible as it is extremely hard to modify transactions in one block without altering all following blocks, thus making the system extremely safe. As blockchain technology becomes more mainstream, businesses in the payments industry are now looking forward to blockchain-based solutions to address high costs associated with the paper-based manual payments process. All transaction-related costs could be effectively eliminated with the help of blockchain since the technology nullifies the involvement of another third party, which helps cut down overall costs. Also, speed enhancement is of the utmost benefit that blockchain brings forth to the industry players. Currently, cross border payments are carried out through correspondent banks, which is inefficient and lengthens the whole process. And now with blockchain, payments can be made anywhere within a short period of time by eliminating intermediaries and using algorithms to verify and authorize payments instantly.